Do you have puzzles laying around mixing pieces? 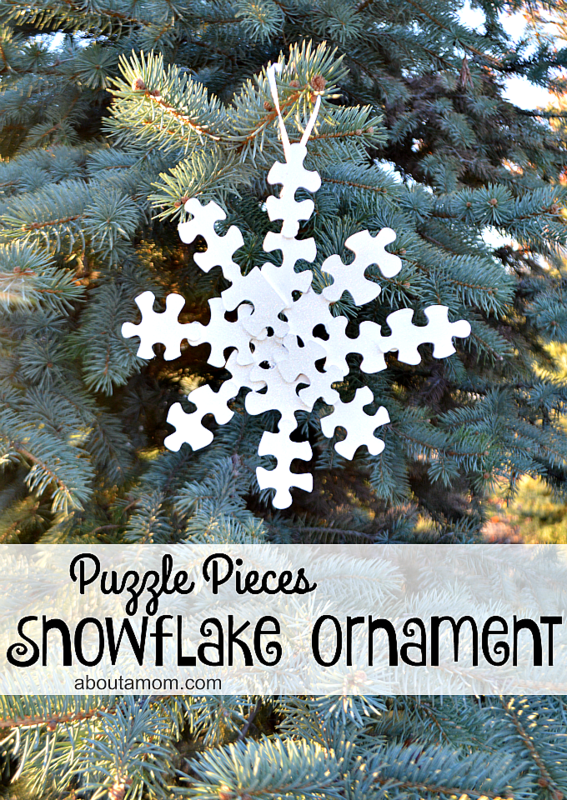 I have great Snowflake Christmas Ornament you can make with your kids using those pieces. Not to worry if you don’t have any puzzles laying around, check out your local thrift shops, I bet you will find some used puzzles for almost nothing. I actually thought I was using a thrift store puzzle when I started this project until my son informed me that I had just glued together his Spiderman puzzle (mom oops). Puzzle pieces-The amount of pieces depends on the size of your puzzle pieces. I used 16 pieces in total. 1. Layout your design. The backside of the pieces will be your top. 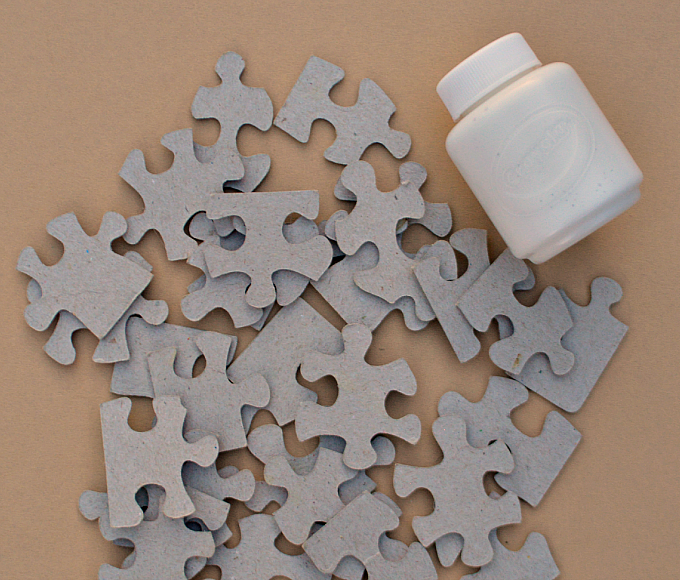 Use a glue gun to glue 4 puzzle pieces together overlapping the ends. 2. Glue 2 pieces together overlapping the ends. Do this 4 times. 3. Lay glued pieces from step 1 vertically. Attach pieces from step 2 to piece from step 1 forming an X pattern with those pieces. 4. Glue 4 more pieces together like you did in step 1. Glue those to the top of the already glued pieces. 5. Paint the snowflake white and immediately apply glitter. 6. Once the snowflake has dried, determine which end will be your top and forming a loop glue a piece of ribbon to the back of the puzzle piece to make a hook for the ornament to hang. Younger kids will need an adult to do the gluing. They will have fun painting the snowflake and adding glitter. If they are anything like my kids, the glitter will be their favorite part. I don’t know what it is about glitter and sprinkles, but they always go crazy with both. When we make cookies with sprinkles, we end up with a lot of sprinkles and a little cookie. 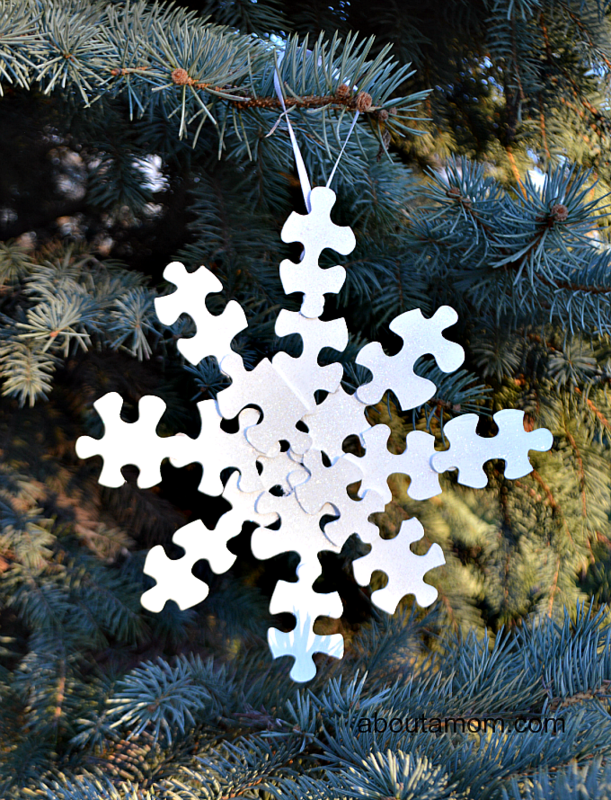 I love this idea for a snowflake ornament! We definitely have puzzles with missing pieces we could do this with. Perfect way to use missing puzzle pieces or you can buy cheap puzzles at the dollar store. My kids would have fun with this one and it looks great too! Thanks for the tip on the dollar store Amy! 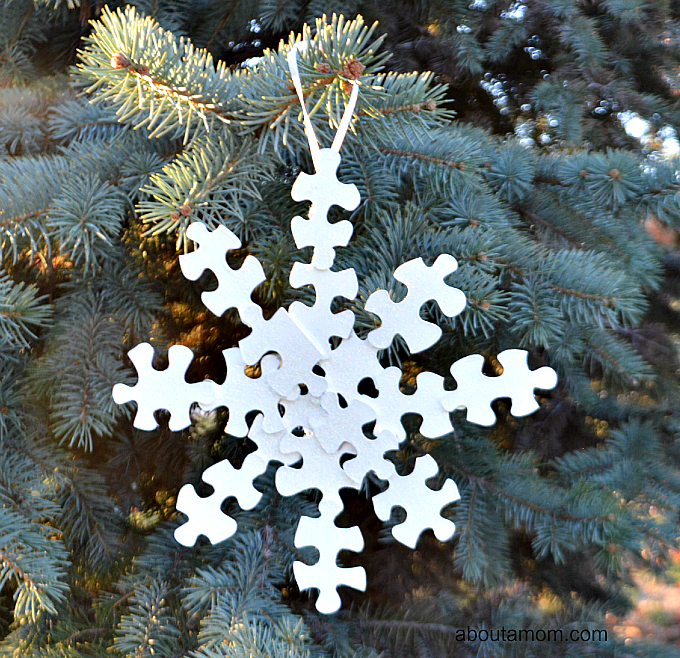 A white puzzle snowflake ornament! How cool is that! I would love to have these snowflakes all over my tree! That would be beautiful Julie! This is a very cute craft project. It would be fun to make with my niece before we decorate our tree. This is such a cute craft idea. I love to make ornaments for the tree. This is super cute and super easy! Love it! I love this idea, great way to recycle and decorate at the same time. This would be a fun project for the kids to tackle. Great idea. We always lose puzzle pieces. Now we can put them to use. I would never have thought to use puzzle pieces to make a snowflake, I love it.